The Super Bowl is somewhat of a national holiday, turning what would be a normal Sunday into a feast of tailgating and football. Though the big game was held across the country in Santa Clara, California the city of New York nonetheless celebrated in stunning fashion. The Empire State Building lit up for Super Bowl 50, tracking the score with elegant LED lights featuring team colors for the Denver Broncos and the Carolina Panthers. The top of the building's iconic tower will be evenly split in Denver orange and Carolina blue at kickoff, shifting with each touchdown to show the color of the scoring team. Whichever team has the lead during the game will dominate the Empire State Building with their colorful presence. Their primary color will remain on display in between scoring plays so long as they're on top. The Bronco's top notch defense is up against an incredibly dynamic rushing game by way of the Panther's Jonathan Stewart and quarterback Cam Newton himself. Such a match-up saw a whole lot of color changes on the Empire State Building, which is set to shine late into the night and up until morning with the winning team's colors on display. This light show isn't the first time that one of the most recognizable buildings in the world has celebrated the Super Bowl in a dazzling way. Super Bowl light shows from years past include the aforementioned model as well as a fan-driven #WhosGonnaWin social media campaign unveiled by Verizon for Super Bowl XLVIII held in 2014. Fans who tweeted with Verizon's #WhosGonnaWin hashtag were treated to a light show based entirely on social media momentum leading up to Super Bowl Sunday's real time scoreboard light show. 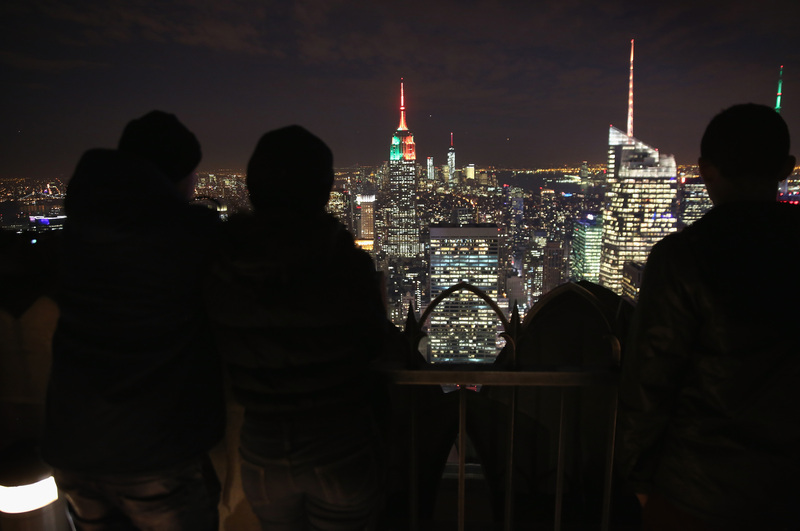 This year's Super Bowl was similarly dazzling for the Empire State Building. Winning team the Denver Broncos can now bask in the glory of victory on both coasts. The Empire State Building has been lit up deep blue and Denver orange and will maintain its vibrant hues from now until dawn, with an extra special light show occurring the hour following the Super Bowl. Fans have taken notice and are avidly snapping photos of one of the prettiest buildings in New York City that happens to be looking even nicer this fine Sunday night.